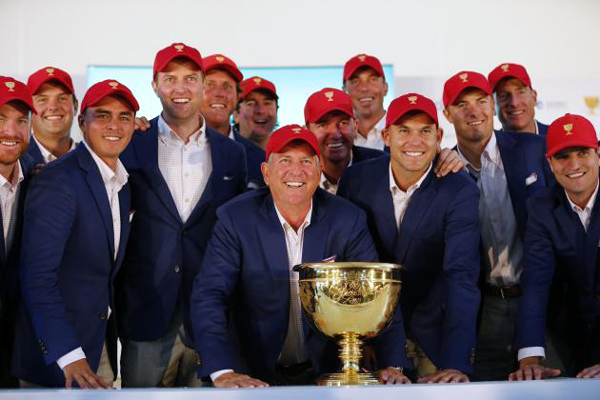 Captain's pick Bill Haas claimed the crucial final point at the Presidents Cup on Sunday, as the United States beat the Internationals 15.5 to 14.5 to clinch the team golf event for the ninth time in 11 editions. Haas, who is also the son of US captain Jay Haas, held his nerve in the last of Sunday's 12 singles matches to beat local favorite Bae Sang-moon on a day of missed putts, momentum swings and hand-wringing tension. Jordan Spieth and Jason Day, the top two players in the world, both lost their matches, while there was delight and heartbreak in equal measure for Asia's four representatives - Thongchai Jaidee, Anirban Lahiri, Hideki Matsuyama and Bae. After five straight comfortable US wins, the one-point margin of victory was the narrowest since the Americans won 16.5 to 15.5 in 1996, and suggests the PGA Tour got it right by reducing the total number of points on offer to 30 from 34. An emotional US captain Jay Haas struggled to get through a televised interview next to the 18th green but said he had given his son a pep talk through the closing stages. "I told him, 'Come on, win one for your mom, your mom deserves this,'" he said. "We put him out 12th and had no idea this was going to happen. Couldn't even have dreamt this." The Internationals trailed 9.5 to 8.5 going into the final day at the Jack Nicklaus Golf Club Koreabut got the first point on the board when Adam Scott thrashed an out-of-sorts Rickie Fowler 6&5 to level the match. Louis Oosthuizen eagled the 18th to claim a half of his match against Patrick Reed, while fellow South African Branden Grace beat Matt Kuchar 2&1 and became just the fifth player to win five matches at a single Presidents Cup. American veteran Phil Mickelson, who has played in all 11 Presidents Cups but needed a captain's pick for the first time since 1994, crushed Charl Schwartzel 5&4, while Dustin Johnson overcame a game Danny Lee, who led by one through 14 but then lost three in a row. The early American red plastered across the other matches on the scoreboard began to fade in the afternoon as Japanese sensation Matsuyama fought back to beat J.B. Holmes and Thai Jaidee took an unexpected half point when Bubba Watson missed from five feet on the 18th. Watson missed a similar tiddler at the same hole on Saturday but he was not the only one who struggled with short putts on the difficult final hole. Lahiri, the first Indian to play at the Presidents Cup, lipped out from just over two feet to hand Chris Kirk victory, just as the Internationals looked to be turning the corner. "I had Bubba Watson come up to me about a minute after we finished up and he said that he had done the same exact thing," said a despondent Lahiri. "I guess wasn't meant to be unfortunately." After Spieth was stunned by Australian Marc Leishman and Day lost to Zach Johnson, the Cup boiled down to the final match between two captain's picks -- Haas and Bae. South Korean Bae, playing in his last event before he swaps four irons for firearms and begins compulsory military service, trailed by one with two holes to play and drained a 10-footer on the 17th that kept the Internationals' hopes of a tie alive. With the home crowd's hopes on his shoulders and the fate of his team in his hands, the pressure finally told on Bae and he cracked on the last, stubbing his chip into a steep bank and seeing the ball roll back down the hill. International skipper Nick Price was determined no blame should be apportioned to Bae and Lahiri and said his team could have had a much easier task had it not been for their woeful foursomes performance on the opening day. "I don't want any of you to be negative in any way toward Anirban and to Moon," Price told reporters. "The truth of it is, is that if we got off to a better start on Thursday and we had not been 4-1 down, it might not have been quite as exciting today ... so we all feel for Anirban and for Moon for what happened. But they are part of our team, and we will leave here as a team." The Presidents Cup returns to US soil in two years' time at Liberty National, New Jersey before coming to Melbourne for a third time in 2019.